Andrew offers a discount of 50% on their first / introductory lesson! BA Hons degree in Fine Art, Painting. Offering lessons in painting and drawing. I am primarily a painter and have always been committed to the arts and image making, and have wide experience in various disciplines. For 22 years I have run my own Stained glass studio making windows mainly for churches. Prior to that I spent some years working in scenery painting industry, mostly in London. This involved a lot of teamwork and painting with others, which I enjoy. I can also offer lessons in photography/digital image manipulation with Adobe photoshop. I also exhibit as a freelance painter. Offering tuition in drawing and painting in all media. 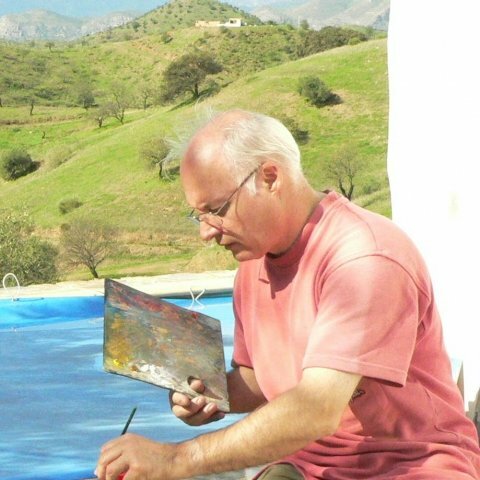 I particularly enjoy the challenge of doing on site Plein Air painting in oils and watercolour and can offer instruction in this method. Apart from studio work, sessions could be held in the town or in the rural landscape. Stained glass: Additionally I can teach all aspects of stained glass. I have always needed to instruct helpers in my stained glass workshop, producing new designs and bespoke windows primarily for churches. This has meant training helpers at different levels in all aspects of this arts and craft discipline. Set painting: For some five years I was leader of a paint shop, for a London based theatrical set builder. This required versatile artistic skills and also the ability to work experimentally in many different painting media. Responsibilities included the training and directing of helpers at all levels of experience. I have designed and organized the painting of stage sets for a local opera group over the period of at least twelve years. I feel that a teacher needs to be sensitive to discover the needs of the student and then be able to give good guidance. I am quite experienced and intuitive in assessing abilities. I’d gauge strengths, weaknesses, and would encourage the student to recognise and develop their capabilities. I enjoy working with people of all ages and would aim to inspire their confidence, encourage discussion on the meaning of the work, and hopefully bring enthusiasm and commitment to the subject. It is important that the student enjoys the process finds the work a rewarding experience in order to help realize their potential talents and ultimately self expression through their art. AndrewFrom Hannah (5/5): Andrew is a really lovely man who gave a fantastic lesson and my daughter thoroughly enjoyed it, thank you Andrew! Reply from: Andrew:Thank you, Hannah. It was good to meet you all and enjoy Your daughter's enthusiasm and keenness to learn. Looking forward to her next lesson. AndrewFrom Victoria (5/5): Andrew has given my two children an introductory art lesson. I was very impressed, firstly with the variation of resources he brought, and secondly for his enthusiasm. The children really enjoyed the lesson too. Andrew adapted the lesson to suit their interests and showed the the magic effect of pain applied over light coloured crayons. We look forward to our next session and would warmly recommend his art tutoring service to others. Reply from: Andrew:Thank you Victoria. I very much enjoyed the lesson too; it was a real pleasure teaching your children and seeing their enthusiasm.